Price: £2.60 (incl VAT) Sorry, this product is no longer available. 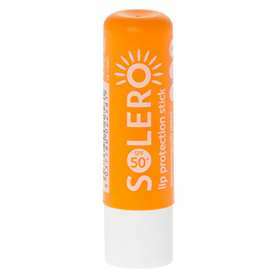 Solero Lip Protection Stick provides your lips with high UVA/UVB protection, and keeps them moisturised so they dont dry out in the sun. Apply the sunscreen product generously before sun exposure. Wait for sunscreen to be fully absorbed. Reduced quality will lower level of protection significantly. Re-apply frequently to retain protection, especially after perspiring, swimming or towelling. Avoid contact with clothing, fabric and surfaces. Permanent staining is also possible even after product is fully absorbed. Ricius Communis Seed Oil, Caprylic/Capric Triglyceride, Diethylamino Hydroxybenzoyl Hexyl Benzoate, Cera Alba, Euphorbia Cerifera Cera, Copernicia Cerifera Cera, Ethulhexyl Triazone, Bis-Ethyhexyloxyphenol Methoxyphenyl Triazine, Hydrogenated Castor Oil, Dicaprylyl Carbonate, Butyrospermum Parkii Butter, Simmondsia Chinensis Seed Oil, Tocopherol. Product code: 6152383 Price: £2.60 (incl VAT) Sorry, this product is no longer available.